Who doesn’t know someone who has suffered identity theft, an email hack, or some dangerous virus? Horsesmouth is headquartered in New York City. No doubt you’d agree that the word “hacked” has been in the news more recently than ever before. The truth is hackers never sleep. Their malicious networks run 24/7 and anyone with an Internet connection faces the threat: personally, professionally, and even as citizens and patriots. The problem is so serious, we won’t be surprised if fixing the public’s poor cybersecurity is declared a national emergency someday. That’s why we’ve made it our mission to dramatically change this story. After the infamous Target data breach in 2013, we saw that the public wasn’t being given consistent, coherent, and do-able advice about boosting their online security. So we created the Savvy Cybersecurity program to train financial professionals to deliver the “One Hour to Savvy Cybersecurity” workshop, a live, interactive event that could quickly identify people’s key security vulnerabilities and give them clear direction on how to become safe using their computers, smartphones, and tablets. Since then, that program has been delivered hundreds of times in the U.S. and Canada to rave reviews (learn more here). But we realized we needed other ways to reach a greater number of people. 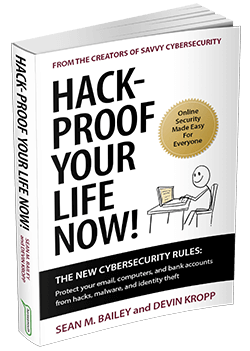 That’s why we’ve just published a book called Hack-Proof Your Life Now!The New Cybersecurity Rules: Protect your email, computers, and bank accounts from hacks, malware, and identity theft. Your clients and prospects will thank you for helping them boost their online security. Add it to your gift program now. for as low as $8.98 a copy. 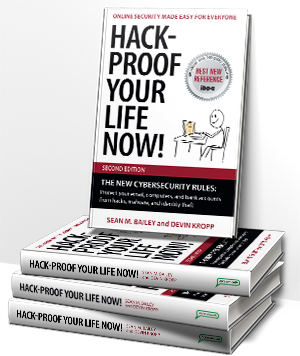 I’m Sean M. Bailey, editor in chief of Horsesmouth and co-author, along with Devin Kropp, of Hack-Proof Your Life Now! Our book is like no other cybersecurity title available for one simple reason: It doesn’t scare you. It doesn’t overwhelm you. Instead, it shows you how to quickly measure your current Cybersecurity Score and then gives you a little more than a dozen action steps that will easily boost your cybersecurity in just a few hours. That’s why we think you can provide a tremendous service to your clients and your community, by taking the Hack-Proof message to them. The book, available to you at very deep discounts, is a cybersecurity survival guide. Learn more about bulk sales here. Our book begins by asking you to measure your online security with a 10-question cybersecurity quiz. Nearly everyone scores poorly. Secrecy: Your email addresses, passwords, credit files, Social Security numbers, and other personal information need greater levels of stealth protection. Governments and private companies have done a miserable job guarding our personal data. Only your actions can limit your vulnerability to hackers’ data breaches. In the book, we offer eight secrecy-boosting rules, including this one: RULE—Create a Secret Email Address: Stop using your personal email address for your online banking and credit accounts. It’s too easily stolen. Instead, create a financial-only email account to use exclusively for your finances. That limits your exposure to just a few secure places on the Internet where your financial-only email resides, making it harder for hackers to scoop up and use against you. Omniscience: Just like the banks do, you must use technology to become “financially all-knowing” and monitor—in real time—your personal banking and credit matters. By placing yourself at the center of your online security (a key theme of the book), we can rest assured that identity thieves aren’t quietly stealing your money or ruining your credit. For instance, here’s one omniscience rule we recommend: RULE—Create Text or Email Alerts. Enable your banking and credit cards to instantly notify you whenever cash leaves your account or credit is charged against your name. That way you’ll be able to instantly spot fraud or identity theft, a solid protection to have at no extra cost to you. Mindfulness: Once you (and your clients) enact the New Cybersecurity Rules, you’ll have a stronger security mindset. But how do you stay that way? Safety degrades without permanent changes to your computer behaviors and security awareness. For instance, you can’t stay hack-proofed if you don’t routinely update your software (it’s closing dangerous security holes) or back up your data (the best protection against cyber blackmail). Just like our cars need critical, routine maintenance, the same must be applied to our computers, tablets, and smartphones to keep cyber miscreants away. But the hackers' malicious spam never stops. Even the best protected inbox will still receive a few dangerous emails. What to do? RULE — The 10-Second EMAIL Rule. Our book will teach you and your clients the 10-Second EMAIL Rule, an easy to remember mnemonic to avoid being fooled into clicking on dangerous links. EMAIL stands for “Examine Message and Inspect Links” and shows you how to spot and unmask dangerous blackmail spam and identity theft malware. It’s a Zen-like practice that can benefit us every time we check our mail. #1 Demonstrates Your Dedication to Help Clients. There's nothing really like Hack-Proof Your Life Now! and its unique approach to helping any reader boost his or her online security quickly, easily, and in an organized manner. #3 Easy Storage in the Office and Easy to Carry Home. It's always good to have something special around your office that you can give a client or prospect on the spur of the moment. Hack-Proof Your Life Now! is a handsome, lightweight paperback with some powerful messages. Whatever triggers the situation, you can reach for one of your Hack-Proof Your Life Now! copies as a quick, meaningful gift. #4 Gives Clients Peace of Mind. Once a client learns the New Cybersecurity Rules we teach in Hack-Proof Your Life Now!,they’ll understand how much safer they’ve become. You’ll have saved them from the bad guys—literally. #5 Ideal for Convenient Shipping by Mail. Hack-Proof Your Life Now! fits easily into a small envelope and can be mailed inexpensively to your clients. #6 Reinforces Your Position as Teacher and Expert. Hack-Proof Your Life Now! is one of those books that will open your clients’ eyes about cybersecurity and empower them to be smart, safer, and more confident in this critical area of our lives. Here’s the good thing. You don’t need to be an IT tech or computer guru to boost your online security. The vast majority of the New Cybersecurity Rules can be implemented by you, and your clients, quickly and easily. For those who need more help, we have a step-by-step guide and resource section in the back of the book, too. —Only 22% of advisors are happy with their gift-giving program. —48% said their approach needed help or could be improved. —45% of advisors said finding the right type of gift was their major challenge. —40% said finding affordable gifts was their top challenge. —68% of advisors said they send gifts to mostly all of their clients. Advisors told us the median-average cost of a client gift was around $50. As you’ll see when you get ready to order, we’ve made purchasing Hack-Proof Your Life Now! very affordable. (we’re going to show you one time how to do this for a lot less). And the holiday season was the most common time of the year for advisors to send gifts, though many gift throughout the year for various reasons. But what do advisors need most of all? They told us that they enjoy giving books on special topics to clients. Well, it just so happens that Hack-Proof Your Life Now! fits the bill for a solid, helpful, and memorable client gift. It’s designed to be engaging, entertaining, and highly readable, while directing the reader to take quick actions to boost their online security—many of which can be completed in just minutes. We think it’s just the right thing for financial professionals looking to give clients something new, unusual, and extremely helpful. I hope you can see that educating clients on cybersecurity would be perceived as a high-quality gift. We’ve worked to make this both easy and affordable. Hand it out at the end of a client meeting. This is another important way to deliver and reinforce the message that you take your clients’ well-being seriously. Giving them a copy of Hack-Proof Your Life Now! is a nice ending to a productive client meeting, whether a first meeting or a typical client review meeting. They’ll appreciate your thoughtfulness. Personalize it with a short, pithy inscription. A one-sentence note on a blank page at the front of the book is an ideal place to make a statement to your clients that you think improving cybersecurity is worthwhile and important. See some good examples below. Send as a thank-you gift for a nice referral. Books remain a good gift and a sign of your appreciation. Send along a copy of Hack-Proof Your Life Now! to top clients next time you want to thank them for a referral. You don't need to send gifts for every single referral, but this is a thoughtful way to show your thanks. Send as a holiday gift. Mix things up this year with your clients. You can always send a holiday basket another year. Given the state of widespread cyber insecurity, your clients will appreciate getting a book that that can really benefit them—and not add to their waistline! Send as a birthday gift. Turning over a new leaf and improving one’s online security is a valuable activity for anyone, especially when you consider how much of our personal, identifiable information already exists on the black market. So putting in place the protections described in Hack-Proof Your Life Now! would favorably impress any clients. Send to your strategic allies. CPAs, like many professionals, have become sensitized to the issues around cybersecurity. The same for attorneys. They’re all getting caught up in ransomware and other cyber attacks and scams, too. Like you, they'll immediately recognize the quality and utility of Hack-Proof Your Life Now! And by the way, some advisors present the Savvy Cybersecurity presentation to CPAs for CPE credit. Drip it on a special prospect. A number of advisors I've known over the years seem to always have one or two special, long-range prospects they're working on. Keeping in contact in a professional way may involve any variety of tactics. Certainly, your prospects likely have concerns about cybersecurity, too. So sending along a copy of Hack-Proof Your Life Now! is a nice move. Send to your business owner clients. Online security can no longer be left to the IT guys. Every business owner needs to fully up to speed on cybersecurity. Nearly every major hack we know of started with an employee. Your business owner clients need this information. And they’ll value you for bringing it to their attention. Sample Inscriptions: Five Suggestions for Inscribing Hack-Proof Your Life Now! The best way to leave your mark on a gift such as Hack-Proof Your Life Now is to inscribe an inside page. This is the easiest, least expensive route to adding personalization. Of course, you can write anything you'd like. But just to get your creative juices flowing, we've crafted a few sample inscriptions that you're welcome to follow exactly, modify for yourself, or use as your own springboard. We should all know our Cybersecurity Score (p.5) and then take action! Hope you find this helpful. Some very good advice about identity theft inside. Take action and be safe! Hack-proofing our life is a worthwhile goal. Hope you find this helpful. We all need to take control of our cybersecurity. See inside to learn how. Enjoy! Protecting our email and online financial accounts is a must. Hope you find this helpful. Place your order today so you can be sure you’re protecting yourself and your clients. Hack-Proof Your Life Now! is available at a discount for bulk sales including advisors, wholesalers, branch and sales managers, asset management firms, broker/dealers, and other organizations. As low as $8.98 a copy! Price Per Book Bulk Order Price* You Save! *Shipping not included. Book orders ship via UPS Ground. To order bulk copies click here. When you integrate Hack-Proof Your Life Now! and use it to protect yourself, you'll never worry about getting hacked. Use Hack-Proof Your Life Now! as your chief approach to protect yourself from cyber attacks. Take a full year to implement the rules in Hack-Proof Your Life Now! If, after 12 months, you don't feel more safe and secure, we'll completely refund 100% of your purchase price—guaranteed, no questions asked. Just call and tell us you're returning Hack-Proof Your Life Now! to Horsesmouth at: Horsesmouth, 21 W. 38th St., 14th Fl., New York, NY 10018. Phone: 212-343-8760, Extension 1.